With the advancement of the Internet and today’s technology, companies may often forego the traditional work setting of operating day-to-day in an office building, and allow employees to work from home in an effort to cut costs and maintain a lower overhead. Today, since many people work from home, employers can thus extend the reach of their talent pool to more remote regions than ever before. Many times, however, it is beneficial to have company meetings and face-to-face contact, which is where the notion of ‘Liquid Space’ may come into play. Liquid Space is a newer concept where people can pay to use different kinds of workplaces, offices or collaborative spaces in various cities throughout the country. They can rent small conference rooms to work with their coworkers or they can rent an individual desk to finish a project. This is beneficial in a market like San Francisco, where many start-up companies have all or some of their employees work from home because of the high cost of renting and owning in the Bay Area. Liquid Space allows the flexibility of a “work from home” employee to complete most of one’s task at home and then meet in a physical location when needed to finish things with colleagues. In the end, Liquid Space extends beyond company meetings and employee projects, as individuals on business trips or on vacation can rent space for a few hours or a few weeks to work on deliverables and projects. The traditional work boundaries are being challenged, and people have the opportunity to work from anywhere, not just their usual work settings. And, from a real estate investor’s perspective, buying-up commercial space is brilliant in San Francisco as one can subdivide the space, rent it out accordingly and capture the demand found in this market! As, collecting rental income from several tenants vs. just one spreads the vacancy risk, and maximizes earning potential and overall ROI on the holding over the long-term. With the strong entrepreneurial spirit found in San Francisco, Liquid Space is sure to be a growing strategy for both investors and users. · Price “ceilings” are actually below where the free market would dictate the price of a rental. · The results, economists argue, are that the appropriate supply is not met, insuring the problem does not get fixed. · The triangle in the center is a deadweight loss to landlords of units. This gap is where all the political conversations lie: the landlord wants to close the gap; the renter wants it to widen. · Rent control is a re-distributive mechanism which the political left should champion. 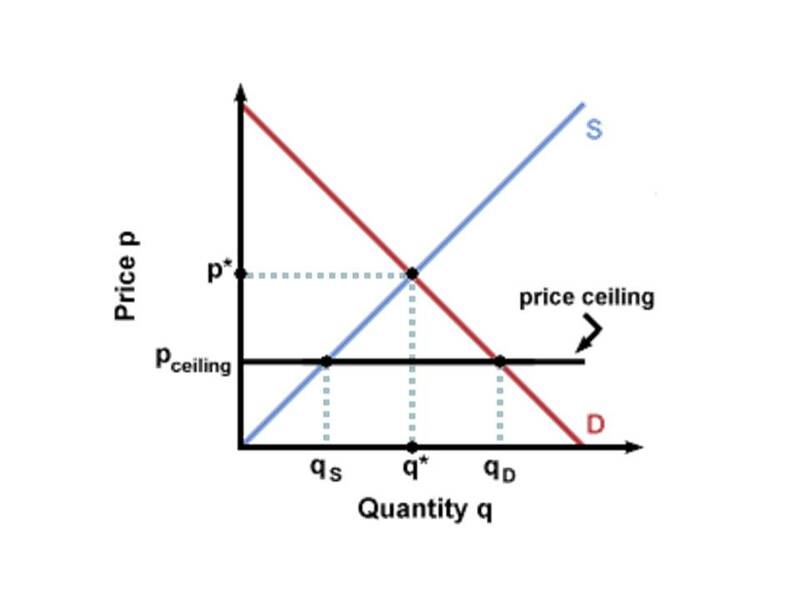 · In terms of supply-and-demand, government intervention can influence the supply-side transiently, while the demand end is a pure function of preferences (free markets). · The point is that Rent Control, the ceiling, is likely to chronically nag below the optimal price threshold. This persistent overhang is the bane of the landlord: ‘cap rates’ are actually “capped” rates, where maximum profits are dictated by government officials. · The dilemma is that of moral and social sentiment triumphantly taking precedence over the economic sentiments of greed and desire for profits. The definition of entrepreneurship is the recognition of dislocated capital, so as to earn extra-ordinary income greater than normal profits. Ø If you are a SF buyer: and considering ownership of a property that will generate income, you need to understand what a realistic cash flow scenario will look like and how the rent-ceiling will impact you, as such variables will help dictate what a Fair Market Value will be. This is how you gain your negotiation power: be sure to consult with a trusted agent who will navigate you through this process. Ø If you are a SF seller: and trying to determine the difference between what the free market is manifesting and what the realistic scenario is, due to rent control intervention, then it is advisable to engage a trusted real estate professional as well. Concluding precisely how one can make the best decision and what their options are in an effort to evaluate whether to sell now, later, or carry-on the renting of space is central to a real estate professional’s knowledge base and acumen. Once again, leverage a trusted resource who can share experiences with you to reap the best possible outcome when determining how to manage your real estate holdings. Learn more about my team and me today!